Bibliobites in March: Better Baking? Martha Stewart has certainly been at the forefront of America’s food renaissance since the 1980s, when Entertaining made a huge splash. Her insistence on topnotch ingredients and attention to detail won her legions of fans. But these days, she seems to leave much to her staff; the “author” of our title is “the kitchens of Martha Stewart.” Obviously there’s nothing wrong with a group effort, but we felt that the book suffered a bit from the lack of ownership that a single author might have provided. There were some unexpected editing mistakes: a pancake recipe labeled “gluten-free” contained wheat flour; and some choices that made the book less user-friendly, such as not warning us when an ingredient was to be “divided”– that is, part used up front and part later. Some ingredients were listed in ways that made it harder to buy them; one recipe lists “3 cups grated zucchini,” when it would be far easier if we’d been told “1 pound zucchini, grated (3 cups)”, since we normally buy produce by weight. These are small complaints, but they did affect our overall enjoyment of the book. And this title suffered from the cardinal sin of absolutely refusing to stay open; the spine was so stiff that it was difficult to keep the book open even with a heavy weight on top (I resorted to using a large cast-iron skillet!). But, as always, these petty annoyances will be overlooked if ultimately there are yummy results. Was that the case for our group of dedicated bakers? Read on, dear friends….. In the breakfast department, coconut baked oatmeal was a winner: it was absolutely delicious, easy to make, and the coconut milk and ginger were perfect accents for the toothsome oats. Another standout was spiced apple and oat scones. These were moist and tender, and the spelt flour in them contributed depth and a touch of sweetness. Coconut pistachio biscotti were good for dunking, but the proportion of cornmeal was too high, which made for a gritty cookie (a better version: http://greekboston.com/cooking/paximathia/). 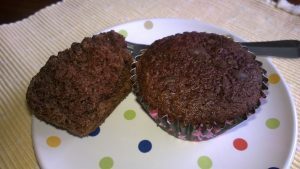 Double chocolate rye muffins had satisfying chocolate flavor, and the rye flour added a slightly bitter backnote that went well with the chocolate. We tried several of the quick breads in this book, with mixed success. Coconut banana bread was praised for its subtle, tropical flavor. It had a beautiful texture, was moist and flavorful, and disappeared quickly! The Irish-style brown bread with whole wheat and rye flours was grainy and good– we sampled this at our meeting topped with smoked salmon and crème fraiche, which elevated it to a gourmet treat! On the down side, whole wheat date-nut bread took way longer to bake than the recipe indicated, and resulted in an inedible brick. Zucchini and chocolate loaves were OK but did not impress. Whole-grain cornbread was similarly fine but not outstanding– it tasted pretty much like any other cornbread. 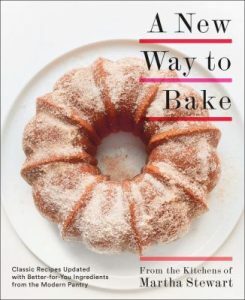 Of course a few of us had to try the luscious-looking apple-cider doughnut cake which graces the cover of the book. 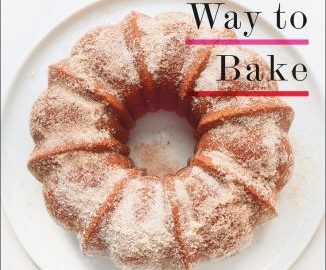 It’s made with whole-wheat flour and olive oil, as well as applesauce and apple cider. One person thought it was heavy and didn’t have much flavor; another thought it was good, but the olive oil flavor was too strong. We sampled this at the meeting and the consensus was that it was tasty and not too olive-y. And, as it turned out, the olive flavor mellowed after a day or so. A third person had overall success with this recipe, though the apple flavor was not as strong as she would have liked. However all agreed that the cake they made looked every bit as pretty as the one on the cover! In addition to the biscotti mentioned above, we tried pecan, oat, and dark chocolate chunk cookies. These cookies were good but fell apart when you ate them. The prescribed 1/4 cup size was too big; and overall they just weren’t good enough to bother with again. The dark chocolate spelt brownies had a nice fudgy taste, but the spelt flour imparted an unpleasant graininess. This was one recipe that tasted like it was trying a bit too hard to be healthy. Whole-wheat fig crumble squares had too much crumble and not enough filling; however, the almond-coconut macaroons, which we were fortunate to sample at our meeting, were very easy to make and a yummy treat. A keeper! And the sweet oat-walnut crisps, while a bit fussy to make, were a delicious less-sweet cookie– really more like a cracker. The coarse salt and flaxseeds added a welcome crunch and flavor. One person bravely attempted a yeast dough, making hazelnut hot-cross buns. These were a major disappointment, producing “hockey pucks.” The dough never rose, perhaps because the instructions never have you proof your yeast before adding all the other ingredients; it was an overall epic fail! The honey whole-wheat bread did instruct you to proof your yeast, but the resulting loaf, though it looked and smelled wonderful, was still unpleasantly heavy and dense. There were a few other epic fails on the savory side of things, mostly to do with various tart crusts. Mushroom tart had a half whole-wheat crust that was extremely problematic. The dough was gritty, almost impossible to knead (as instructed), and absolutely refused to come together, despite multiple tries. After buying a lot of expensive ingredients for the filling (lots of mushrooms, gruyère cheese) it was frustrating to spend so much time and energy on one component that never came out right. The filling did taste very good, though! 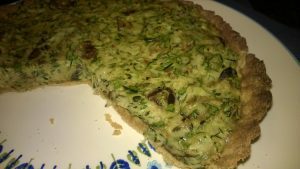 The herb quiche with rye crust had a similarly difficult crust that ultimately was no better than crumbly. And the quantity of filling made for a very thin quiche; as with the mushroom tart, this recipe seemed like a lot of effort for a less than stellar finished product. On the other hand, chickpea-vegetable pancakes were quick, easy, and delicious; good for lunch or a snack. If you’re interested in whole-grain baking, here are a couple of titles that are worth checking out: Good to the Grain by Kim Boyce; or Better Baking by Genevieve Ko. Our next meeting will be Friday, April 27 at 11 AM in the Fireplace Room. We’ll be in uncharted waters, learning about – and cooking Korean food! There are multiple titles; please choose one. All are available at the main desk. Guettae manna! (See you then! in Korean, according to Google Translate).